Comparison between the cut R-Rated DVD by New Concorde and the uncut FSK 18 VHS by VMP. 57 cuts = 11 minutes and 2 seconds. 1 alternative scene = no difference in running time. This cheap action B-movie was released in the US in a heavily cut R-Rated version. Many scenes were shortened by a total of 11 minutes in order to tighten the movie. The violent scenes are all still intact. So far, an uncut version has not been published in the US, therefore the German FSK 18 VHS has to serve as point of comparison. The drunk guy with the two women in his arm is stumbling around longer. 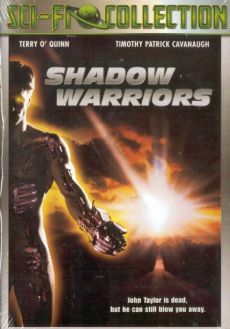 The title of the movie is different: R-Rated: Shadow Warriors / FSK 18 VHS: Techno-Fear. Connors adds that they will not only develop a new race of man but also a whole new world because they are able to. Barkley answers that he does not think too much of that. Connors tells Barkley that he does not like this pessimism. A shot of Taylor waiting at the limousine is missing. Connors starts the limousine after they all got into it. Various x-ray pictures can be seen in the surgery. Taylor is being operated on longer. Yuri introduces Connors to his new colleague Vladimir, they greet each other warmly. The female employee says that they have even 127 instead of 123 and that they might have more. Barkley meets Nathalie in the elevator. He wants to invite her for a coffee but she says that this is not possible because she is married. However, he is actually interested in Taylor's reanimation and wants to know whether he has own thoughts at all. She answers that Taylor does not know that he died at all and that his memory is limited to what they tell him. Barkley asks her for her opinion of what they are doing. She says that she has no time to explain this to him and that she has to leave. Valdimir takes the chip, looks at it and approaches Mikail's neck. After Connors has told Barkley that he does not seem to be very excited about his new toy, he answers that toy seems to be the right word. He objects that he turns humans into machines, manipulates them and makes money out of it. Barkley also wants to know when the same would be done to him. Connors just asks whether Barkley is done already. Long tracking shot over the bodies in the sleep capsules. The next shot of Connors is longer as well. The camera gets closer to the sleeping Mikail. The first shot of his dream about his family is missing as well. Longer shot of Connors working at the computer. The camera is tracking to the sleeping Mikail again. Another dream sequence of him is missing. Barkley meets Taylor at the airport. He complains to Natalie that he does not want Taylor in his proximity because he fears that Taylor might blow a fuse just like Mikail did. Taylor answers that everything is right with him and that he will not make any problems. When Taylor exits the picture, Barkley insits that he does not trust him but Natalie assures him that she herself entered Taylor's new program. The airplane is rolling along the airstrip longer. The shot of Mikail is longer. Mikail's walk through the village is a lot longer, the shot of the flashback of Mikail's family was shortened as well. Mikail walks towards the bus stop. A shot of a few people looking at Mikail getting into the bus is missing. After throwing the driver out of the bus, Mikail is sitting at the steering wheel and drives off. The tree that was shot by Mikail can be seen longer. The R-Rated shows a shot of Taylor running away instead. The uncut version shows the shot of Taylor running away at this point. Barkley tells the pilot that Taylor will have a chance to get into the helicopter when he reaches the path in the field. The helicopter can then be seen flying behind Taylor. Mikail is walking through the forest for a longer time. The shot was shortened a bit. Barkley sayst to Yuri that Natalie was right and that the only chance to stop Mikail is to give Tylor the same batteries they gave to him. He asks Yuri whether he knows another possibility and reminds him that they are all sitting in the same boat. Mikail is walking around longer. The scene of Mikail's family at the beach is a bit longer. The next shot of Mikail standing in front of the children is longer as well. Natalie tells Barkley that he is always asking question she does not have answers to. Bakley then adds that they have been watching Connors ever since the death of the real Taylor. Longer shot of Barkley in the jeep. The helicopter is flying over the base longer. Martina and Valdimir enter the apartment. Valdimir draws a gun and puts it on the table. He then walks to Martina. The following shot of Mikail climbing up the ladder on the outside was shortened as well. Martina begs Mikail for her life longer. Mikail answers that he has no choice and needs to follow his mission. Natalie wants to know what Barkley is planning. He answers that he will do what he should have already done. He then draws his gun and aims at Mikail from the helicopter. The shot is a tiny bit longer. There is more dancing and partying at the event. Barkley goes to the ship. The camera tracks towards a wall painting when Barkley runs out of the picture. The first shot of the running soldiers is missing. Longer shot of Mikail walking next to the railroad tracks. Mikail is driving the jeep through the city longer. Additional shot of Barkley and Natalie. Several soldiers run past Barkley and Natalie. Taylor and Koprinski run longer towards their goal. Barkley walks out of the picture after he has seen Mikail and Natalie driving away with the boat. The helicopter above Mikail can be seen in an additional shot. The helicopter can be seen a bit longer again. Mikail is shooting at the helicopter longer.